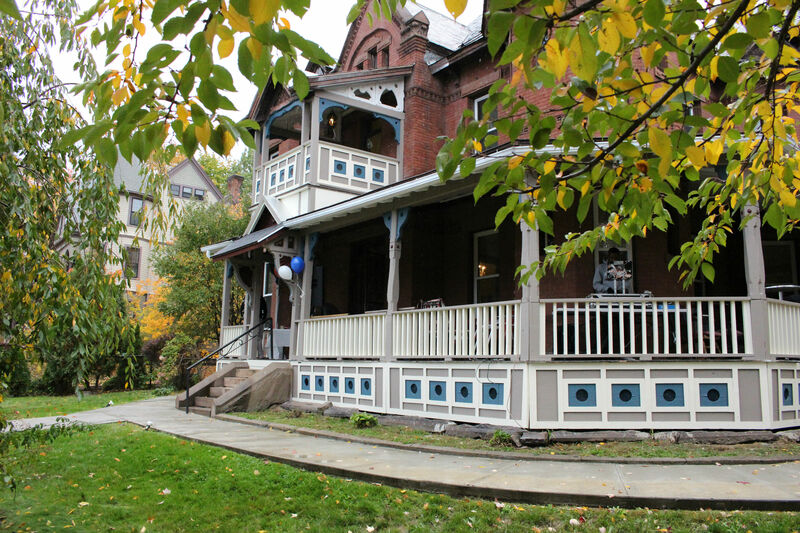 Jay's Bed & Breakfast at 1109 Dwight St. is in business officially on June 3 with a grand opening from 4:30 to 7:30 p.m. Candelario gave The Republican a tour of the 126-year-old, former Judge Moriarty mansion, which he said he bought for $90,000 in 2009 and has spent $300,000 renovating. Upgrades included replacing a third of the slate roof damaged in a fire nearly 10 years ago, he said.The business has five bedrooms that will go for $125 to $150 a night. He also plans to host events and do catering, he said.The common areas have fireplaces, parlors, seating alcoves, stained-glass windows, wall art, including a big painting of Buddha overlooking the dining room, and sculptures and chandeliers. There are also enclosed-porch and other outdoor seating areas.He is familiar with the "why Holyoke?" skepticism, Candelario said. The site is 10 minutes to Springfield with easy access to Interstate 91 and the Massachusetts Turnpike. More than a dozen colleges are nearby. Annual events lure crowds like the "Big E" fair in West Springfield, Six Flags New England in Agawam, the thrice-yearly Brimfield Antique shows and attractions like the Basketball Hall of Fame and Volleyball Hall of Fame, he said.Not to mention the weddings and other events held at Our Lady of the Cross Church, directing across from his front door, he said. "The list goes on," Candelario said. "I find that people like to stay in a bed-and-breakfast because it's like they're still at home. "He was born in Puerto Rico. He grew up in Amherst and here, when his mother followed her sister to New York and the extended family moved to Massachusetts. He graduated from Holyoke High School and said that, growing up, the Holyoke Boys and Girls Club was a blessing where he learned to speak English and play sports. "The Boys and Girls Club was our safe haven,"
The first property he bought was the carriage house at 1141 Dwight St., across the driveway from the bed-and-breakfast building, in 1997. Eventually he bought the other carriage house adjacent to it along with other properties here, in New York City and in eastern Massachusetts, he said.